The whole holiday region at the accommodation price! The holiday in a BrixenCard – member hotel is twice convenient: You pay the accommodation price – and you get the possibility to discover the whole holiday region! Brixen and the holiday villages have got quite something to offer: if you want to discover our marvellous region, staying in one of our hotels or apartments is the best choice! In our accommodation price the BrixenCard is included for free. You will get it at your arrival and it allows you to enjoy the highlights of our holiday region – without paying anything for public means of transport, cultural offers and other activities! You can use all public means of transport of the South Tyrolean transport system – regional trains to Trento, buses, City- buses and all public cable cars. An extensive cultural offer awaits you with guided tours of Brixen and various events of the tourist office. The BrixenCard gives free entry to 82 South Tyrolean museums, such as the Abbey of Neustift, the Diocesan Museum in Bressanone-Brixen, the Pharmacy Museum in Bressanone-Brixen, the Archaeology Museum with Ötzi, the Mining Museum Schneeberg, the Messner Mountain Museum Firmian, the South Tyrol Museum of Ethnography, the Feldthurns Castle, the Trostburg Castle and many others. 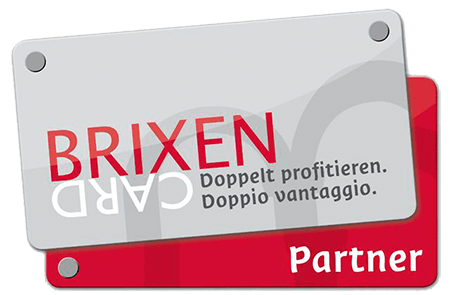 The BrixenCard grants discounts for leisure activities: mountain bike tours, bowling alley etc. Your children will get the BrixenCard as well – for a pleasant family holiday!